I do love salmon. After trout, it’s probably my favorite fish. It usually gets the simplest preparation at my house: grilled in the summer, broiled in the winter. In either case, we coat the fish lightly with a spice mix and nothing more. This week’s selection for French Fridays with Dorie, Salmon with Basil Tapenade, adds yet another technique option to the repertoire. I’m not a very good meal planner. We have a CSA share for the month of July (won at a silent auction). Earlier this week, when I picked up the share, it included a generous amount of fresh basil. I wasn’t thinking ahead to Friday, so I promptly made the entire lot of it into pesto. I didn’t realize that I should have reserved some for this dish. In the end, I just substituted my pesto for the chopped basil, which tasted just fine. 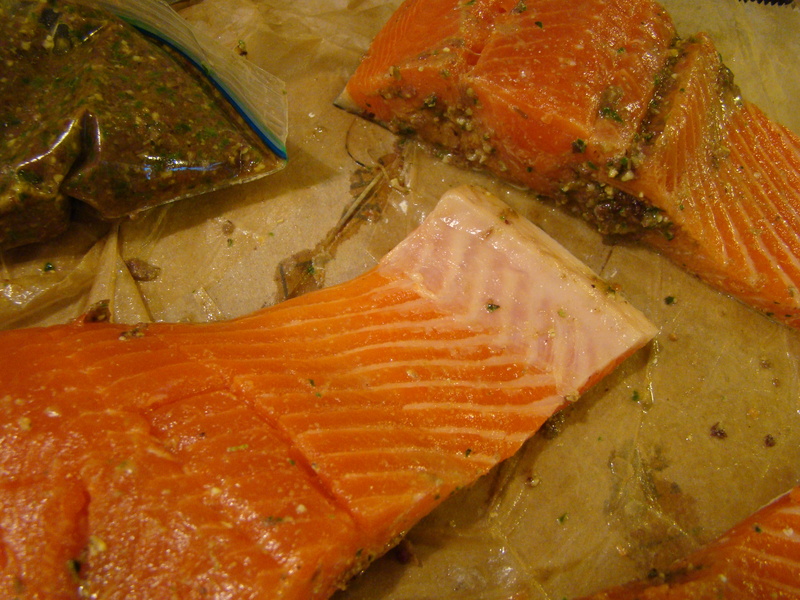 For the fish, I cut a one pound fillet of wild coho salmon into three 5-ounce pieces. The recipe was confusing when it described how to cut pockets in the fish fillets for stuffing with the aromatic tapenade (a blend of tapenade, pesto, and lemon zest and juice). I couldn’t figure out whether it was a one-inch slit that went partially or all the way through the fillet, or whether it was a one-inch slit along the entire edge. Howard and I both read it through multiple times and demonstrated to each other what we thought Dorie meant. In the end, I went with two slits that went from edge-to-edge, on either side of the center bone. Stuffing the fish with tapenade was incredibly messy, and in my opinion, not worth the trouble. 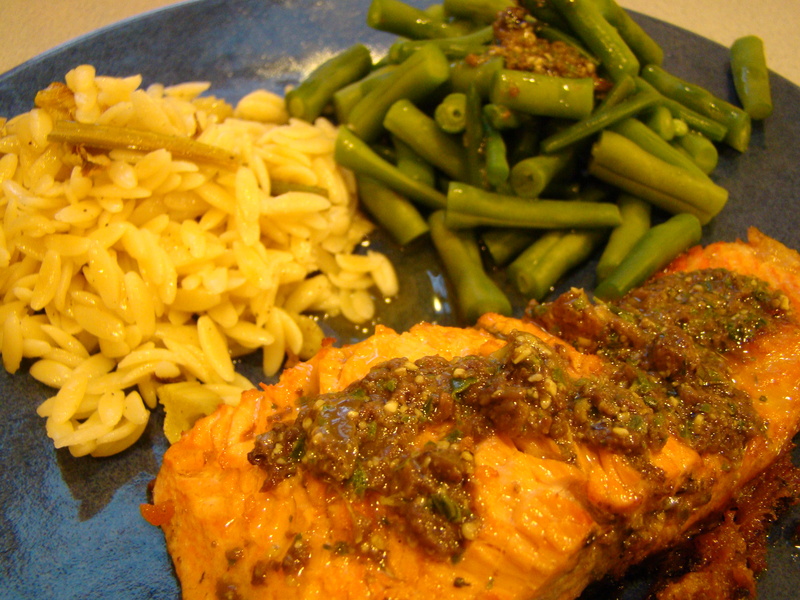 With tapenade sauce topping the cooked fish, I found that gave plenty of flavor and would have been enough. I liked the cooking method. 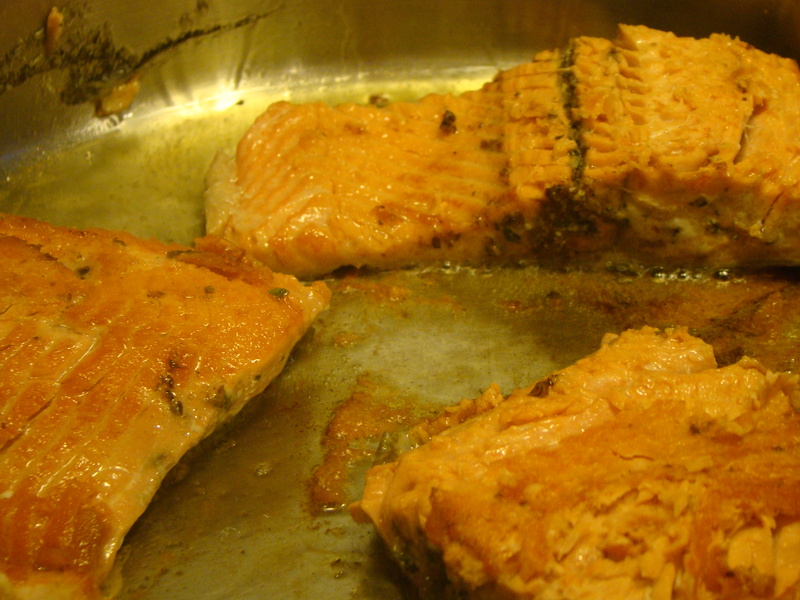 The fillets are seared in olive oil in a hot skillet on the top side, then the skin side. Then, the skillet of fillets goes into a very hot oven to finish off the cooking. Everything was so hot, I didn’t test as I went, I just used the times in the recipe. The fish was slightly overcooked. Next time, I’ll cut a few minutes off the final roasting step, not that it’s very long to begin with. I had a little trouble flipping the fish. It’s a good thing the sauce is opaque and masked some of the torn flesh. I used a high-sided skillet and suspect that the angle for turning was too sharp to do a perfect job. I served the salmon with orzo tossed with roasted fennel and some green beans with a dollop of the tapenade sauce (veggies courtesy of CSA mentioned above). It was a delicious meal, and I’m looking forward to tomorrow’s leftovers! I’m looking forward to reading about what my fellow FFwD bloggers thought about this week’s recipe. Check out their links under the Leave Your Link post for this recipe at French Fridays with Dorie. We don’t post the recipes, but consider getting your own copy of the book, Dorie Greenspan’s book Around My French Table. I continue to admire my bees’ industry. The bees continue to behave. They must be happier as they leave us alone. When Howard cut the grass last week, a few flew into him when he crossed their flight path, but no one linger or chased or stung. As spring unfolded into summer, a wide array of flowers has been in bloom. I’ve been hyperaware of pollinators in my garden this year. Every time I spot some motion among the flowers, I check to see who is gathering pollen or nectar. 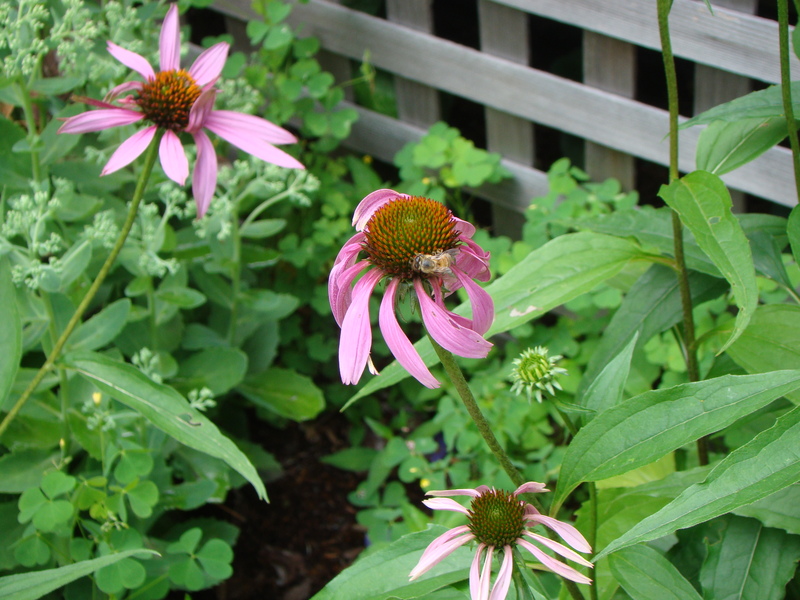 Happily, native pollinators are alive and well. The bumblebee population seems healthy, or at least, highly visible. However, I have had limited sightings of honeybees on my flowers. It’s surprising because thousands of them are residing right in the yard. Well, I am happy to report that I finally spotted some honeybees on flowers in my yard. 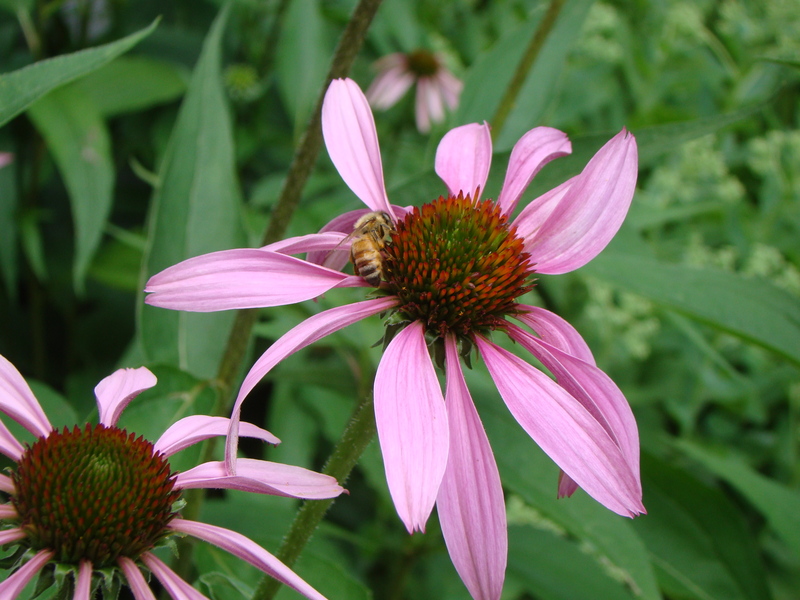 The purple coneflowers (Echinacea) seem to be popular for the honeybees as I’ve made multiple sightings on the distinctive heads of these flowers. Very exciting! We’ve been having a little heat wave, again. The bees keep the temperature inside hive quite warm (for my taste). Normally it’s in the low to mid-nineties. When it’s extra hot, the bees try to keep the hive from overheating. Too hot could kill the brood. The way they try to regulate the temperature looks a little scary. It’s called bearding, and to the uninformed, it could like they are ready to swarm. Fortunately, I saw pictures in one of my beekeeping books, so I remained calm when I saw this happen. This will typically happen in the evening as all the bees return home for the night. The more bees inside the hive, the warmer it will be, kind of like when you are in a crowded place. Bees are hanging out outside the hive to reduce the population inside which, in turn, makes the inside temperature less hot than it would otherwise be. In addition, the bees may be fanning to help with ventilation. 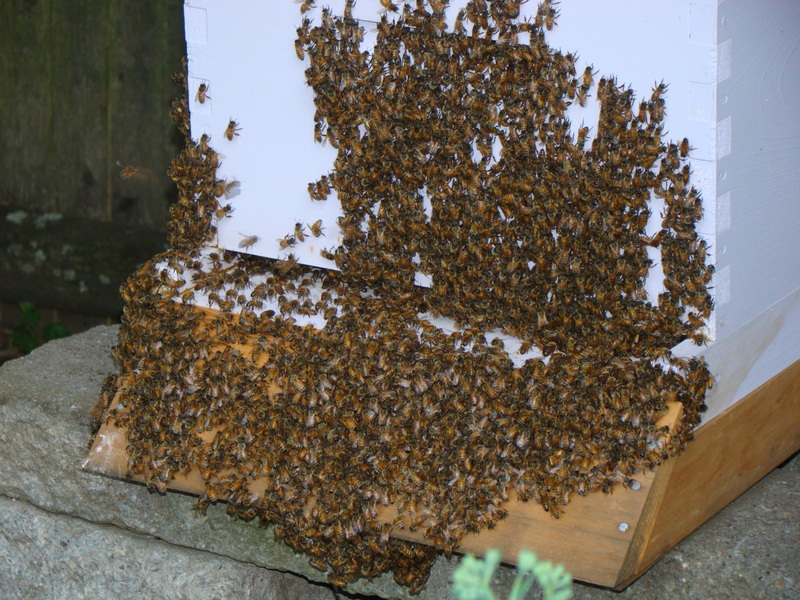 By morning, the bees usually have gone back into the hive or off to do their daily work. 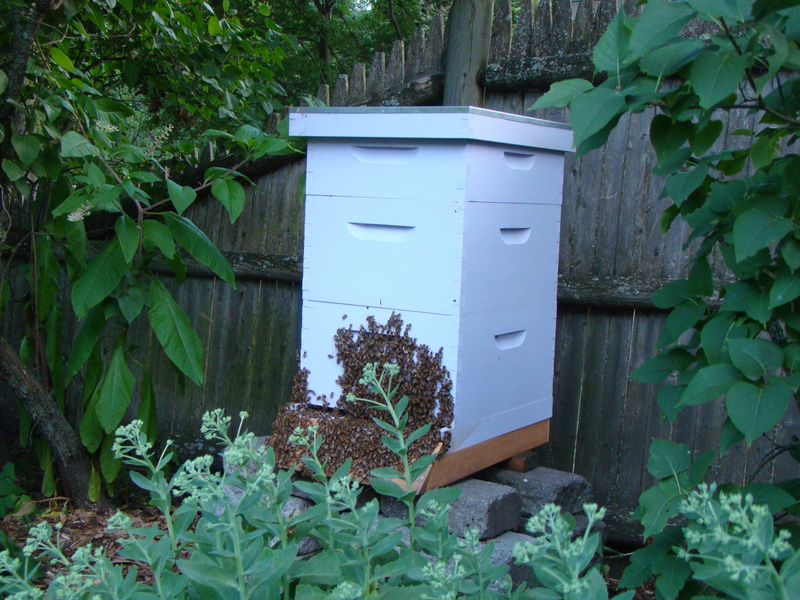 If the weather cooperates, I’m planning another hive inspection this weekend. I want to check what’s going on inside. I’ll let you know next week how it goes.